The first Hindu wedding we filmed took place in downtown in Chicago. The year was 2009. An Indian bride was searching the internet for something unique. I had just started Delack Media Group. It was either pure luck or coincidence that she found our website. She proceeded to tell me how much she liked our style of filming weddings but didn’t see any Indian wedding work on our website. Since we had just started, we hadn’t filmed any Hindu weddings. I was aware of them…just didn’t have the right opportunity cross our path. She took a chance on me and hired us to film her wedding. While filming the wedding, I shot alongside Michael Rastall of Michael Rastall Photography; who to this day is still a great industry friend. He even shot my bio photo in this blog post! Anyway, I digress. What proceeded at this wedding was an amazing tapestry of colors, sounds, dancing, and culture. I filmed the event just like I used to film news stories….capture whatever you’re seeing and bring the viewer there. We edited the wedding and delivered it to our clients. They were ecstatic. After that, we started getting calls from relatives and friends of that first couple. They wanted the same thing…a cinematic wedding film that told a unique and creative visual story about their day. Before long, we started filming all sorts of Hindu weddings around Chicago. We also received inquiries to film Hindu weddings around the country and world. Our Indian wedding work even captured the eye of Oprah’s producers; where some of our footage was featured in “Oprah’s Next Chapter”. While meeting with couples who wanted to hire us to film their wedding, I realized there was a common theme. Most of them had no idea what the Hindu wedding was all about, the meaning behind all of the ceremony’s rituals, and what they were doing on the wedding day. If I asked questions about their ceremony, they’d look at eachother and say out loud, “I think the bridesmaids try to block him from leaving at this part,” or “Wait, don’t you put the garland around me then?” Even while filming Hindu weddings, I’d see family members and guests also confused about various rituals. Because many Hindu priests only performed the ceremonies in Sanskrit (the ancient Hindu language), those who didn’t speak the language were naturally lost. So, many of the weddings had printed guides to inform guests about what they’re watching. If everyone is confused about the rituals of a Hindu wedding, why do it? There’s so much lost in all of that. Well, in talking with everyone, many couples decided to go with a traditional Hindu wedding because of a few reasons: their parents were pushing for it, they wanted to honor their ancestors, and they found it to be pretty downright cool. Afterall, who doesn’t want to ride in on a horse or be carried into their wedding ceremony? So, I got to thinking…what if I use my talents of video production and put together an informational video that takes viewers through the Hindu wedding ceremonies and explains the meaning behind them? So, about a year ago, I embarked on this journey…interviewing Hindu priests and collecting information from all the Hindu weddings we filmed. What I learned was very interesting…there really is no uniform Hindu wedding ceremony. Every Hindu wedding we filmed did different rituals. Depending on which part of India the family is from, they may have their own special way of performing the ceremony. The concept is very similar to the different denominations of Christianity. Not all of them perform the wedding ceremony the same. However, there were many common rituals that all of them performed. So there was a common thread throughout. 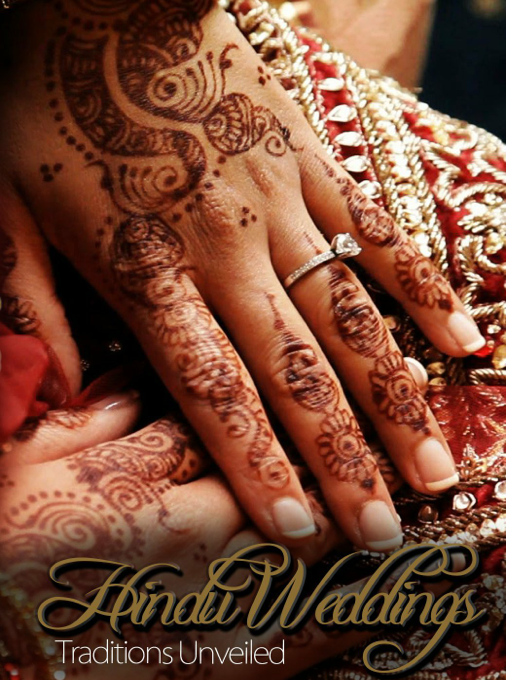 Hindu Weddings: Traditions Unveiled was created for those wanting to learn more about Hindu wedding cultures and traditions. This film allows you to witness the magnificent events from a front-row perspective; just as our film crew saw them on the day of the wedding. We went through hundreds of hours of video and spent weeks editing, finding and working with a professional voiceover, designing artwork for the album, working on distribution, authoring menus, and producing the final product. We ended up with a video that’s approximately 36min 23sec in duration. It’s packed with all sorts of tidbits I learned along the way about a Hindu wedding. My hope is that the video will help couples who are planning their wedding, those who are attending a Hindu wedding, and people who are interested in the religion…and who want to learn more about the meaning and cultural aspects of a Hindu wedding. CLICK HERE to watch the first 45 seconds of Hindu Weddings: Traditions Unveiled and order your downloadable or streaming copy today! If I had to describe Jillian and Matthew’s wedding day in just one word, I’d have to pick “spectacular.” Everything about their day was the epitome of romance and glamour. It was amazingly beautiful. We were so honored to be a part of it. The day started with Jillian and her bridesmaids getting ready at the father of the bride’s home in Wayne. The group was so happy to be together for such a special occasion, and that set a joyous tone for the rest of the day. The couple exchanged vows before their 300 wedding guests at St. John Neumann Catholic Church in St. Charles. Jill and Matt chose to write their own wedding vows, which added a personal and emotional touch to the ceremony. It was hard to find a dry eye in the church! It was a pleasure to capture the Jill and Matt’s wedding day on film, and of course we always enjoy working alongside Chicago’s favorite wedding planners, Big City Bride!